MPN : 22851. 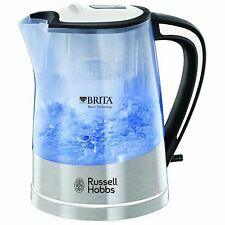 1 x Brita Maxtra filter. Internal blue illumination. Keeping Your Water Pure. Box Contains. 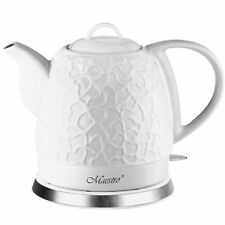 Maestro 1 L. White Electric Ceramic Cordless Kettle UK adapter free. A modern kettle The original shape and high class. The kettle has a built-in heating plate, which ensures quick heating of the water and saves energy. A modern kettle The original shape and high class. The kettle has a built-in heating plate, which ensures quick heating of the water and saves energy. Free UK adapter. Modern design. We are pioneer in Kitchen Accessories. This Panasonic kettle is a design icon for the kitchen. For sale this Modern Panasonic Electric Kettle NC-DK1. Polished Black and Stainless Steel. Very Good condition. Boxed with Original Instructions. Blue Illuminating Dual Water Gauge. 2 Year warranty. Removable Washable Filter. Net Weight: 0.884kg. Boil Dry Protection. Brew hot drinks quickly and efficiently with this stylish and compact kettle. The kettle is complete with a 360-degree swivel base with integrated cord storage, which makes it suitable for both right and left-handed users. Prevents furring of all kettles. Available in silver colour. Made from stainless steel. Blue Illuminating Dual Water Gauge. Plug Adapter not supplied. UK Plug - This item is fitted with a Type G 3 Pin plug type. Boil Dry Protection. 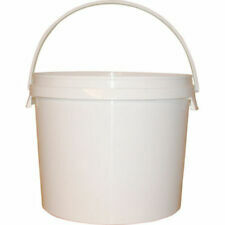 – Up to 1.0 litre capacity. Stainless steel housing. – Base station with cord storage (stainless steel sheathed). – Lockable safety stainless steel lid with one-handed operation. Features: Ideal for use on any type of cook, including angled handle keeps your hands away from the flame of your stove top and holes on the lid let out steam so you know when the water is boiling. Professional experience, easy to use and clean. Our full-fledged professional coffee flavor can be tasted at home; Beautifully crafted for an expert cup of coffee. Use it on any stovetop. Our gooseneck kettle is compatible with any type of stove top, whether it's induction, halogen, electric or gas. Prevents furring of all kettles. Available in silver colour. Double Wall Housing - plastic inside and stainless steel outside. On/Off Switch Indicator Light - Blue LED. Removable Filter. Electric Kettle with Variable Temperature, 1.2L Gooseneck Pour-Over Kettle for Drip Coffee and Tea, BPA-Free 304 Stainless Steel Kettle with LCD Display and Keep Warm Function Kettle, 2200W. Faulty goods will be replaced under warranty. Double Wall Housing - plastic inside and stainless steel outside. On/Off Switch Indicator Light - Blue LED. Benedict Court. Exceptional Service. Outdoor & Leisure. They feature a filter basket so can be used to brew loose leaf tea as well as "proper" coffee. Filter basket. Being made of stainless steel they will not taint and are resistant to rust and discoloring. It features an easy to read water level indicator on the side and a removable and washable filter in the spout. It is easy to clean and use. Manual override. Capacity: 1L. Water level indicator. Power indicator light. 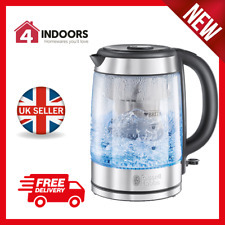 Russell Hobbs 22851 1L 2200W Transparent Plastic Kettle. Box opened but never used. Unwanted gift. Dispatched with Royal Mail 2nd Class. 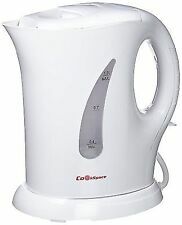 UK 1L Water Kettle Tea Coffee Induction Cooker Camping Kettles Stove Whistle Teapot. Applicable to: gas stove, induction cooker, spirit cooker. Solid handle for you to grip easily and do not hurt your hands. The outer wall is made from clear plastic; it protects the glass from shocks and makes it much less prone to breaking. See the water bubbling up in this double wall glass kettle and it's crystal clear. Condition: Very good condition, clean inside. Get Supersized Images & Free Image Hosting. Capacity: 1.1 Litres. This kettle has seen very little use and is in perfect working order, although it has been in a cupboard for a while so the steel has a tarnished look (see second photo). Dr. Hetzner temperature controlled gooseneck Kettle - Specialty Coffee. Condition is New. Dispatched with Royal Mail 2nd Class. 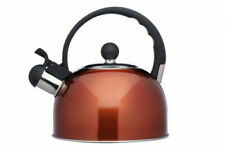 NEW PENDEFORD ALUMINIUM KETTLE. Ideal for camping gas stoves. Suitable for electric but not halogen, ceramic or induction hobs. Heat resistant handle. Silver in colour. 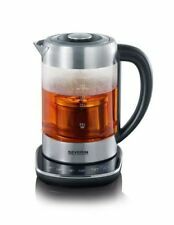 Klarstein Garcon Pro Electric Kettle 1 Litre, 1850-2200 W, Stainless Steel. Max capacity: 1 litre. 360 ° wireless kettle. Simple and elegant: elegant stainless steel case, no rust, no plastic. Digital display. The rapid boil zone is a widget inside of the kettle that allows you to boil exactly the right amount of water for one, two or three cupfuls. And that's not all, by making use of the rapid boil zones it could save you up to 66% less energy. This is for a used stainless steel Kelly Kettle water boiler 1.6 litre. Although it has been used it works perfectly, the inner column of the kettle and base are discoloured due to usage but this is normal after a few uses. 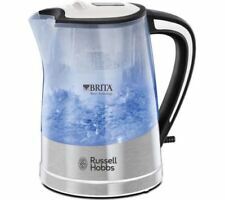 Russell Hobbs Brita filter kettle. Condition is Used. Collection in person only. Small Kettle Electric Travel Camping 1L With Continental Plug Great Condition. Small Kettle Electric Travel Camping 1L With Continental Plug Great Condition.. Condition is Used. Dispatched with Royal Mail 2nd Class. Hario Buono Pouring Kettle for pour over coffee making.